Just because it is in the goldilocks zone does not mean that the porridge won't kill you! The habitable zone is named due to the fact that for life to exist, if there is a chance a planet will be inhabited, liquid water needs to be present. The habitable zone forms an annulus, donut shaped, region around a star, where water is condensed but not frozen so it is not too hot or cold. This gives it the more popularized name, the 'goldilocks zone'. Although the ability to harbour liquid water greatly increases the likelihood of life evolving on a planet it does not automatically mean any planet within this zone is habitable. This can even be seen within our own solar system, Venus is just inside and mars is just outside, the edges of our suns habitable zone. Yet the presence of life on mars seems to be in continuous debate with evidence that liquid water once flowed on the surface although it sits outside the habitable zone. At the other end of the scale it is clear that there is no chance of life on the surface of Venus, where temperatures soar due to the planet’s atmosphere causing the greenhouse effect trapping vast amounts of solar radiation (as well as high volcanic activity). The recent announcement by the Kepler team of Kepler-22b has been hyped up in the media to be earths twin. Kepler-22b is the first planet in the Kepler list to have an orbit similar to that of earth around a very average sun like star. Its orbit is also keeps it within its stars habitable zone. Currently the published data for Kepler-22b states that the radius is 2.4 Re (2.4 times the radius of the Earth) with a temperature of around 22 degrees celcius. These values are still preliminary estimates and with no information on the massdensity and composition cannot be estimated. 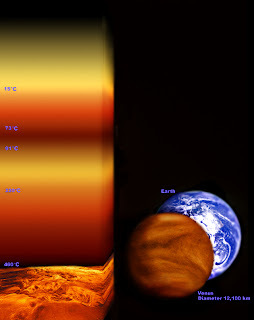 Also as has been shown with other exoplanets, the radius varies with wavelength due to atmospheric absorption. Different chemical species in the atmosphere block out different portions of light at specific wavelengths. The different species will then have an effect on the temperature of the planet due to their interaction with stellar radiation, such as the greenhouse effect seen on earth and to a larger extent on Venus. Follow up observations of this planet have likely been bumped to the top of the list and with more data come more understanding (in most cases). It may be shown to have liquid water in the future but the atmosphere is the key. So what I ask of the readers is that, although any planet in the habitable zone is likely to be very interesting to study, you should not assume life could ever exist there. Venus ('Earth's sister') is a habitable zone planet but I would hold off on booking a holiday visit. I look forward to the many fascinating worlds that we will get to explore, albeit from afar, and hope to keep an open mind concerning habitable zone planets but will hold off until greater atmospheric data presents itself.